How is your prayer life? Do you pray for the lost? Do you pray for your city? Do you prayer for your government? Do you pray for those in your own church? 40 Days of Prayer is an event inspired by the longsuffering and abundant mercy of a holy God and modeled after the dedicated period of fasting and effective, intercessory prayer of Moses. Moses led and lived among a rebellious people destined to perish under God’s wrath. Sound familiar? Like Moses, we desire to seek and apply God’s wisdom as the world hopelessly applies man’s wisdom to address cultural, social, economic, political and spiritual matters. 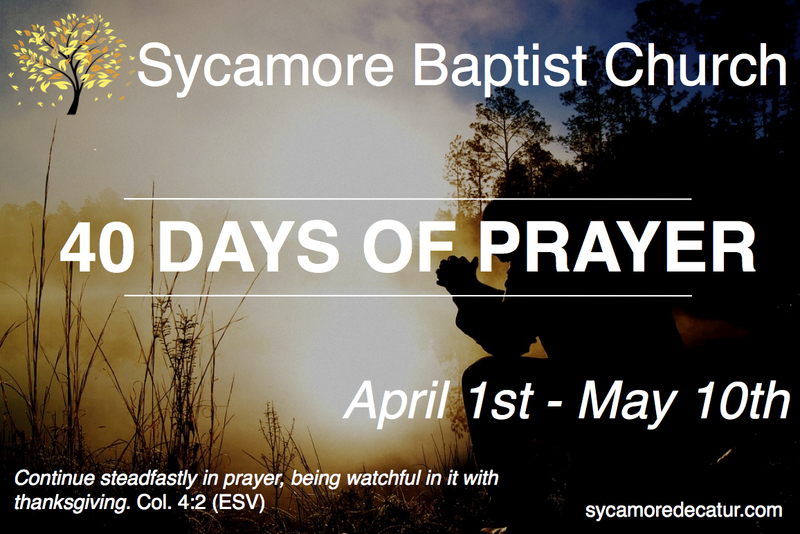 We invite you to partner with us in a focused and fervent 40 days of prayer. In order to prepare our hearts to pray for 40 Days, we wrote 7 daily devotionals. We are encouraging those who desire to pray alongside of us for the next 40 days to read through these devotionals and fast one day during the week. In an effort to help you prepare your heart to pray for 40 days, I will be posting those devotionals on my blog for the next 7 days.